Gordon Farr worked on The Bob Newhart Show and Three's Company, among others. I mentioned in a recent column that, romantic that I am, I used to enjoy the TV show The Love Boat. It turns out the creator of The Love Boat, one Gordon Farr, is a Toronto native who has been living in the city the past few years. Farr not only created and produced the first three years of The Love Boat with his wife, Lynne, but he wrote and produced The Bob Newhart Show, Bridget Loves Bernie, Maude, Three's Company and The Jeffersons. "I give the credit to old John Bassett [now deceased]," says Farr when I meet him for lunch. "I was producing, directing, writing and booking an early show at CFTO, long before Canada AM. Peter Jennings was doing the news and Tim Ryan, sports. I was making $150 a week. It was around 1964, '65. A group of us were discussing that maybe we should have a Directors Guild of Canada, and we signed our names to a list in support of it. "Well, the list made its way up to John Bassett, who roared, 'I'm not having any big unions in here.' " Bassett told his staff to fire the last two names on the list. "My name was the last on the list and that was that. "He scared the sh-- out of me," Farr says of Bassett, "but I admired him. He was a big, handsome, take-control kind of guy, and because of that, I all of a sudden found myself out of work. A friend of mine said, 'God, I hate it here. Let's go to L.A.,' and next thing I knew I was on a plane and I got a job in Hollywood writing questions on a game show making US$250 a week. "I had so much money I didn't know what to do with it," says Farr. "So I sent John Bassett two dozen roses, and continued to do it every June 6th for a number of years." Farr heard through the grapevine that every year when Bassett got the roses, he would yell, "Who the hell is Gordon Farr?" Farr had to sue Aaron Spelling over the rights to The Love Boat. "It was my show, I had been flogging it everywhere, but Aaron Spelling got the idea from someone at Columbia I had pitched it to. I had pitched it everywhere -- all the networks were witnesses. ABC was scheduled to carry it, so our lawyers wanted to depose Fred Silverman, head of ABC." Apparently, Silverman went to Spelling and said, "Take care of this." Farr tells me a settlement was reached, and he and his wife went to air as the show's producers with Spelling as executive producer. "Aaron was the best producer I've ever worked with," says Farr. "He had a huge knowledge of film, was a cosmic salesman and was wonderful with people." Farr estimates that Spelling personally grossed about US$1-billion from The Love Boat. The show itself grossed more than US$2-billion. How much did Farr make? "A lot," he says. 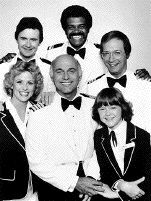 THE LOVE BOAT "CREW": (front row) Lauren Tewes (Julie), Gavin MacLeod (Captain Stubing), Jill Whelan (Vicki); (back row) Fred Grandy (Gopher), Ted Lange (Isaac) and Bernie Kopell (Doc). The show is syndicated in about 44 countries. "I received a cheque from Qatar two weeks ago," he tells me, "for three cents." These days, Farr guest lectures at Humber College in the comedy writing program. "I always point out that it's called show business for a reason," he says. "It's a business, and all decisions should be business decisions. That's the way it was with The Love Boat. We had cards on the board every week with our three categories -- drama, comedy, romance. It was a formula that worked, and we never deviated from it." Farr says scripts have come a long way since the early days of television. "Back then, a Jew and a Catholic couldn't get married without a backlash," he says. "When I was producing Bridget Loves Bernie [Bridget was Catholic and Bernie was Jewish] and the actors Meredith Baxter and David Birney were having a big love affair, we were all getting death threats. It was such a serious situation that even though the show was in the top ten it was cancelled. It was a sign of the times." Farr remembers another incident when he was doing a Petula Clark special. "During the show, guest Harry Belafonte put his arm around Petula. The guy from Chrysler, the sponsor, started screaming. Steve Binder, the director, jumped up, grabbed the tape and locked it in the truck of his car. This was in the early '70s. A week later the story was on the cover of Time, the shot stayed in the show, the rep from Chrysler was fired and Chrysler apologized. I always liked Steve Binder." The talk switches to today's sitcoms. "With Frasier," says Farr, "I think the ratings must have gone down when Niles married Daphne. It's not what the public would want -- they want unrequited love." But, he adds, "the writers are so brilliant they'll find a way." Of Will & Grace, he says, "I think they committed hari kari by letting Grace get married. If you make a major change in a series, the audience gets upset. They want to know what's coming, they want the chemistry to continue." Though if writers make a mistake, they have plenty of options, he notes. On The Bob Newhart Show, for example, he tells me, "Bob was telling everyone that he wasn't coming back after the season, so for the last show we wrote an episode where his wife [Suzanne Pleshette] was pregnant, even though Bob had always insisted there would be no kids on the show. "The day before we shot the show, we got a call from Bob saying, 'Nice script, but who are you going to get to play Bob?' It turns out that he wasn't quitting, he was just threatening to as a negotiating ploy. We had only a few hours to come up with a new end-of-the-season episode. So we went with a dream sequence. "One more thing," says Farr. "We had a gay character on The Bob Newhart Show and we were getting threatening letters because of it. I remember one threat I received that warned me I was going to burn in Hell. It was signed, 'Yours in warmest Christian love.' "